RR- What was it that drew you to reggae music? RR- How old were you then? RR- Talk about your experience with the band Reggae National Tickets. What did that teach you? Alborosie- That is part of the journey. I was a young man back then. Very young, almost a child. That was the foundation of my music. That was the root of my tree. Everything I’m doing now is because I did a good job back then. It was an essential experience. RR- When you first came to Jamaica you worked at Geejam studios. How did that shape your success? Alborosie- The experience at Geejam gave me the chance to actually find out about the culture, about myself…teaching me some studio business. Of course, I was really in touch with the culture because Geejam is in the rural area, the country of Jamaica, in Portland. I went straight to the root. It was a good experience. Every step of my journey is important. It helped me to be the person I am right now. RR- Is it true you worked for food when you started out? RR- How long have you been in Jamaica? Alborosie- 11 years. I’ve lived in Jamaica for 11 years now but the first time I visit was ’94. Used to travel here a lot… Twice a year. RR- Has mainstream Jamaica, musically speaking, accepted you? Alborosie- I’m part of the game (chuckles)…I’m here so people see me every day. RR- Do you get a lot of radio play? Alborosie- Well, it depends, like if I want to promote something. I don’t really push it like that in Jamaica right now because sometimes I don’t need it. Like now, with the new album we have a new single and I push it and dem a go push it. Otherwise, it’s not like I’m fighting for producers left, right, and center. I just keep my music in one direction, which is my direction. RR- Most of your music is self-produced which carries with it many advantages. Have you come across any disadvantages to self-producing? RR- Who wins the battle most of the time, or is it an even fight? Alborosie- Well, Alborosie is a good artist but he has to listen to Alberto…him better behave. RR- How did the name Alborosie come about? Alborosie- That is just a name…. Alberto is my name and ‘borosie’ was a name that some people gave me back then in Portmore….I just combine it…and it sound kinda funny. I neva want a hype name. It’s a name that makes people wonder why I chose that name. RR- You’ve worked with a number of artists, Jamaican and otherwise. Junior Reid’s on the new record. How was it working with him? Alborosie- There’s people that create something…They’ve made history with their music. I feel good working with them. I’m working with the top of the music that I love, which is reggae. To me it’s an honor to be here and work wit dem artists. I have to give thanks. RR- Anyone you’d like to have the opportunity to work with in the future? RR- Tell me a little bit about ‘2 Times Revolution’. That’s a very interesting name for the new record. Why did you decide to name it that? 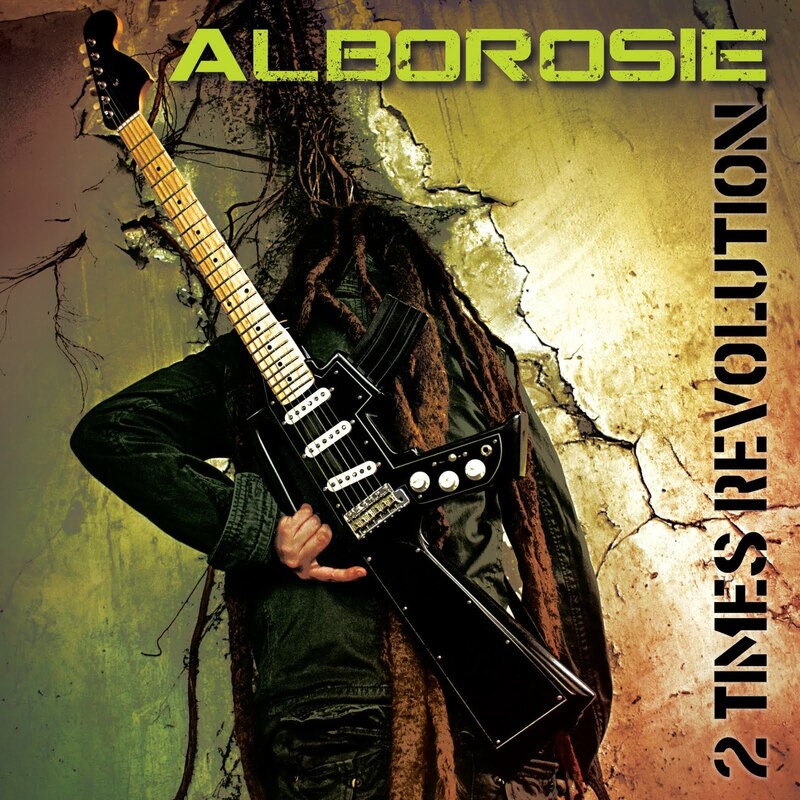 Alborosie- ‘2 Times’ because it’s more powerful…You could say it one time but second time you have more experience…and because we need a ‘Revolution’. We need a spiritual revolution…an evolution through the revolution…call it like that…an the world right now need a revolution. My revolution is a good one. It’s not violent. We promoting one unity. It’s revolution through music. RR- Do you have a favorite track? Alborosie- Not really, but if you ask me I would say to you ‘Who You Think You Are?’. RR- Talk about that track. It’s evident what it’s about but maybe you could just elaborate. Alborosie- It’s very clear…not necessarily because you on stage an you do what you do, you have to be a superstar or behave like a superstar. I’m very humble and down to earth. I jus do what I have to do because that is my mission. The judgment is up to you and the people. I was just describing a situation in my life….the story of my life and how I see things. RR- You mention it in the song, but how difficult was it for you to move from Sicily to Jamaica? Alborosie- Imagine changing your food habits, changing your language. I’ve changed completely. I’m a different person right now. I don’t even know if I could live a Europe now. I’m a Caribbean man right now. Like it, or not, I have to stay here. RR- Just in talking to you, I would think you were Jamaican if I didn’t already know your story. Your accent is perfect. RR- It seems that you get progressively better with every album. How is it you are able to do that? Alborosie- They say that if you leave the wine there and rest for years it gonna taste good. I guess the more I move forward the more the wine taste good. A good wine will never spoil. What possibly could I do tomorrow to spoil this mission? It’s me, it’s my mission…truth and rights and love for people…I could neva spoil it. As I said, I’m very humble and my situation is very easy. If it’s not music tomorrow it’s gonna be something else…that’s how I live my life. RR- Apart from music, what else do you enjoy doing? Alborosie- When I have some time I build guitars. The cover of the album? You see de M-16 guitar? I build that. That is what I do. I just grab some piece of mahogany an I shape it an make a guitar. So far I’ve made like five. I play them on my records and me play dem live too. I never sell my instruments. RR- How did your partnership with VP/Greensleeves develop? Alborosie- Well, they heard my music and they liked it. They approached my management, Specialist. The deal…we liked what they proposed. They’re doing their job. That’s why I’m talking to you right now. They’re serious, they are part of history in reggae music. I’m glad….I’m proud. Let’s hope that this new album gonna work well. RR- You mentioned this spiritual mission that you’re on. Was that a result of you moving to Jamaica or was that present before? Alborosie- It’s been there from day one. That’s me. I’m a spiritual person. I read a lot an I watch t.v. and news. I keep myself up to the times. RR- Talk about the similarities between Jamaica and Sicily. Alborosie- Where I come from is an Island…close to Africa actually…150 miles. I could be a North African. If Jamaica is close to Cuba, and Cuba is Caribbean, then I must be a North African. It’s the same distance. That’s the similarity. That is the vibe. That is the root…the sun, the breeze, the African breeze. I remember when I was young and I was there with my grandfather. My grandfather was a fisherman an him say ‘Alberto feel the breeze from Africa.’ Our culture mix with Africa… That is the similarity. RR- Do you have a tour planned for the U.S.? Alborosie- Yes. We coming to the U.S. at the end of September until October. Next week we going to Europe…European Tour…then after the U.S. we going to South America…Kinda busy. They actually fixing up the logistics of the tour. I think we’re passing through Miami, then California. We’re going to Hawaii and then New York. We’re going places. They’re doing their job. I no really interested inna dat because when I see that I have to do so much work I don’t feel happy. RR- What brings you the most satisfaction from touring? Alborosie- I see so much people are singing the songs. I’ve been traveling a lot. When I go to South America and I see people singing my songs… I see so much people. Lot’s a people in dis place and then Europe, I say ‘Wha?’ I am surprised because of the power of the music. You really can reach out to people and break through barriers. I just have to give thanks. RR- Thank you so much for taking the time! Very nice interview. Thank you for making it happen.